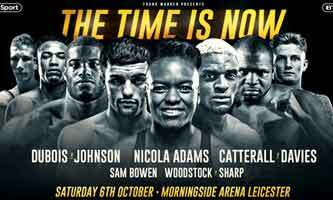 Review by AllTheBestFights.com: 2018-10-06, disappointing and boring fight: Jack Catterall vs Ohara Davies gets one star! The undefeated Jack Catterall entered this fight with a perfect boxing record of 22-0-0 (12 knockouts) and he is ranked as the No.18 super lightweight in the world. He has already fought three times in 2018 winning over Kevin McCauley, Christopher Sebire and Tyrone McKenna (Jack Catterall vs Tyrone McKenna). His opponent, Ohara Davies, has an official record of 18-1-0 (14 KOs=78%) and he entered as the No.20 in the same weight class. He suffered his only loss when he faced Josh Taylor last year (Ohara Davies vs Josh Taylor), after this bout he has beat Tom Farrell, Ahmed Ibrahim and Paul Kamanga. Catterall vs Davies is valid for the WBO Inter-Continental super lightweight title. Watch the video and rate this fight!